Activate by paying 1000 Life Points. Monsters that are banished, as well as monsters in the Graveyard, cannot activate their effects (that start a Chain). Revived King Ha Des appears in this card's artwork. This is ironic, since Revived King Ha Des can negate the effects of monsters (albeit only the effects of monsters destroyed by battle). More ironically, this card's effect cannot negate the effect of Revived King Ha Des. This card has two counterparts: Skill Drain and Mind Drain. Ironically, the monster the Zombie counterpart Revived King Ha Des is based on appears in that card's artwork: Dark Ruler Ha Des. 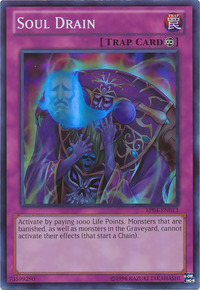 This card's artwork may depict the defeat of Revived King Ha Des as a zombie, through the removal of his soul or draining it, therefore leaving him with no vessel. It could also be possible that this card depicts the transformation of Dark Ruler Ha Des into Revived King Ha Des. In his original form, he could not be revived from the dead, so he had his soul drained by force of an enemy and left himself as a being of eternal resurrection. 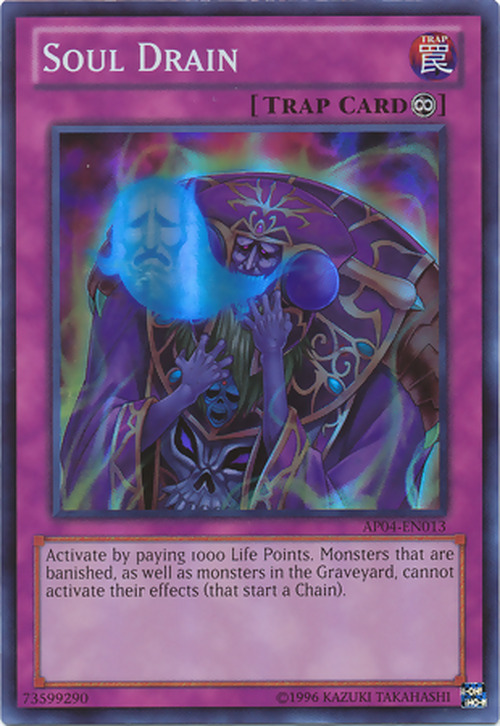 The effect of "Soul Drain" prevents the effects of monsters that are in the Graveyard or that are banished from being activated, so even if "Soul Drain" is active, effects that are activated on the field like "Cardcar D" or "Rescue Rabbit" can be activated. : If "Soul Drain" is active, can the effect of "Cardcar D" be activated by tributing it, or can the effect of "Rescue Rabbit" be activated by banishing it? If "Soul Drain" is applying its effect that prevents monsters in the Graveyard or that are banished from activating their effects, a "Giant Rat" or "Mystic Tomato" that have been destroyed in battle and sent to the Graveyard cannot activate their effects. : If "Soul Drain" is applying its effect that prevents monsters in the Graveyard or that are banished from activating their effects, can a "Giant Rat" or "Mystic Tomato" that have been destroyed in battle and sent to the Graveyard activate their effects? Special Summoning "Grapha, Dragon Lord of Dark World" doesn't start a chain. Therefore, even if "Soul Drain" is active, "Grapha, Dragon Lord of Dark World" can be Special Summoned by returning a "Dark World" monster to the hand. : If "Soul Drain" is applying its effect that prevents monsters in the Graveyard or that are banished from activating their effects, can "Grapha, Dragon Lord of Dark World" be Special Summoned from the Graveyard by returning a "Dark World" monster to the hand? The effect of "Honest" activates in the hand and sends "Honest" to the Graveyard as a cost. Therefore, even if the effect of "Soul Drain" is being applied, the effect of "Honest" can be activated. : If "Soul Drain" is applying its effect that prevents monsters in the Graveyard or that are banished from activating their effects, can the effect of "Honest" be activated from the hand?